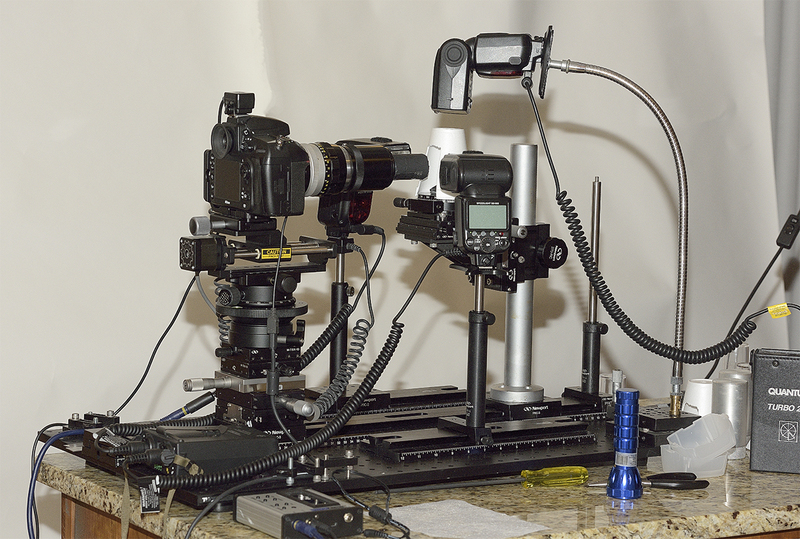 Based on numerous discussions with Rik Littlefield (author of zarene stacker) I finally have my Raynox DCR-150 (200mm=f) working and will probably not use the Nikkor 200/4 Ai'd lens as a relay any further with the Mitutoyo objectives..
this version provides infinity focus at aprox. 220mm camera side with the Nikon D800E.. based on Rik's advice i have placed the objective as close as possible to the reversed Raynox.. The PK-13's provide greater structural integrity than the 52mm tubes and i can place a Nikon PN-11 within the group if i wish a tripod collar on the tube. I have flocked the 52mm tube length between the Raynox and the PK-13's. 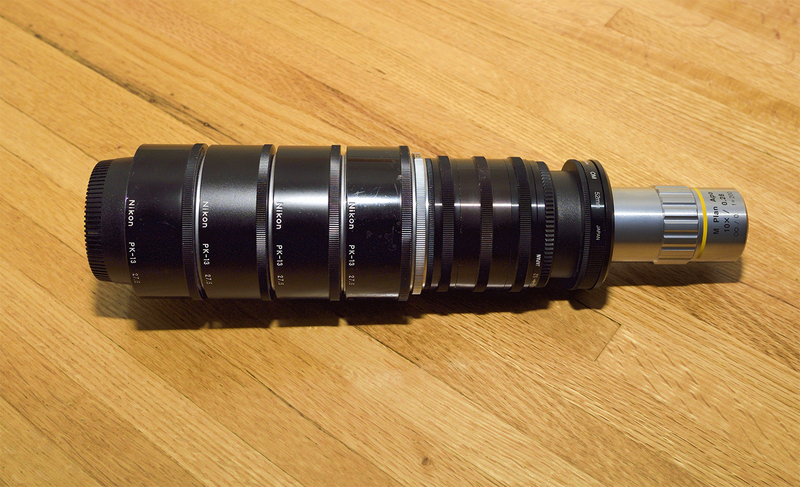 I am now able to attempt non-spec magnifications by adjusting the length of the bellows extension by eliminating a PK-13 or two.. realizing there will be image quality consequences.. so far results have been good. "To clarify for others, the motivation for mounting the objective close to the Raynox in this case is to give maximum ability to adjust magnification by changing the rear extension. The system focal length of a combo can be calculated as 1/f = 1/f1 + 1/f2 - d/(f1*f2) https://en.wikipedia.org/wiki/Lens_%28optics%29#Compound_lenses. Increasing the separation d also increases the combo focal length f, and that reduces the available change of magnification which is delta_mag = delta_extension / combo_focal_length." into the world of macro(micro) photography, it's been fascinating and the images speak for themselves. thank you tony... i guess i have gotten a bit "carried away".. i have nearly forgotten wildlife photography all together..
You should follow your passion Bob, in my experience it's when we produce our best work! One could argue what you are currently producing is still wildlife photography!